In the middle of May 2016, there was a reconstruction of the operation of the 1969 outside broadcast truck, CMCR9, which was Pebble Mill’s original CM1, and later became Manchester’s North 1. The truck was neglected for many years, but is in the process of being restored by enthusiast Steve Harris. The reconstruction brought together retired crew who used to work on the truck in the 1970s, and resulted in the recording of a darts match! CMCR9 used to broadcast a lot of sports programmes, like Match of the Day, but would also have recorded Come Dancing, Gardeners’ World, as well as dramas. 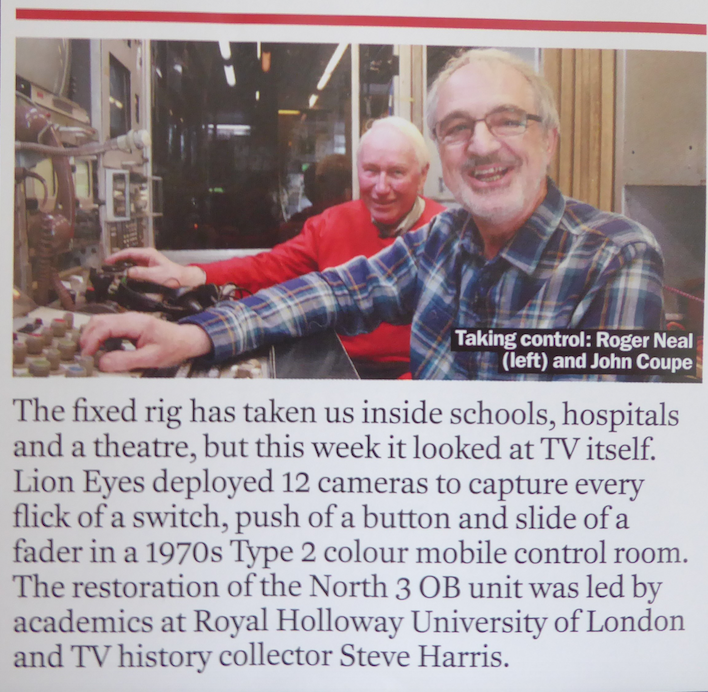 The reconstruction was organised by Royal Holloway, University of London, and their ADAPT research project, which is recording now defunct pieces of historical television broadcasting equipment being used by the people who worked on them. The occasion was marked by this article in the industry trade magazine – Broadcast.